2 models in this series, one 7 foot one piece and one 6 foot 2 piece. Both finished in black with high quality rings. 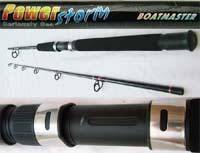 Great boat rod for all types of fishing, they are strong, powerful rods that will handle most species of fish.